Keni review: Keni is a story that has its heart in the right place. However, it is not just about what you say but also about how you say it. Not a just good story that asks a few right questions is enough for good cinema. Keni movie review: Keni should have essentially been a film about a region’s water struggle. But what it becomes is a story of a woman who is touted to be a revolutionary. The basic premise of Keni is extremely intriguing. In a drought struck region on the Tamil Nadu-Kerala border, there is one well that miraculously has water. In a re-survey conducted by the government, the state border shifts a bit causing the well to fall under Kerala, but the house it belongs to comes under Tamil Nadu’s jurisdiction. A tussle for water ensues, thanks to the trigger from owner Indira (Jayaprada). An order is levied that allows only Indira to use the water from the well within the jurisdiction that falls under the neighbouring state. (personally, it refuses to make sense). As the villages continue to suffer, Indira begins her struggle to make the water accessible to everyone. Further, the story unfurls through three journalists who each follow a different lead to the same story. The plot and the narrative device has so much scope to produce a hard-hitting rural drama. But Keni is nothing close to it. In fact, Keni is an example of well-meaning, good premises that don’t necessarily translate to good cinema. Keni should have essentially been a film about a region’s water struggle. But what it becomes is a story of a woman who is touted to be a revolutionary. It would still have been fine had the character been suitably established as one. 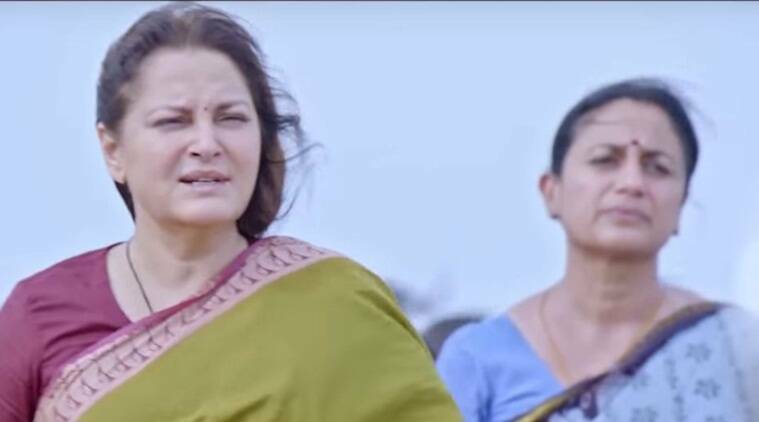 What we get is a frail-looking Jayaprada who seems to insist on maintaining an unkempt look. We don’t see the revolution that every character seems to be talking about. Sure, Indira walks up and down the steps of a few offices, stands in a queue, gets insulted by a few officers. But is that it? Also, is the water from one well enough to agriculturally invigorate an entire village? The film could be easily named ‘Indira’ for the superstar status she is given by her fellow characters. There are several yesteryear stars in Keni who sadly don’t have much to do. Parthepan, Nasser, Rekha, Revathy and Anu Haasan are in roles that they could have sleep-walked through. Also, Keni seems to have a misplaced sense of feminism. I appreciate that every other character on screen is a female. But how are we to buy any of these ‘empowering lines’ when they come as an interruption to a woman speaking? The writing doesn’t convincingly wrap us into its cinematic premise. To sum up, Keni is a story that has its heart in the right place. However, it is not just about what you say but also about how you say it. Not a just good story that asks a few right questions is enough for good cinema.